Are You an Energy Leader, or an Energy Drainer? Test Yourself. I’ll bet you can think of many times – probably very recently – when a leader drained energy from you, or from an entire roomful of people. As a leader, have you been guilty of this? Successful public speakers know they must be the “energy leader” in the room. Regardless of whether their speaking style is quiet or bold, they learn to serve the audience in a way that adds energy. As a result, the audience is inspired and challenged to take action – they leave with a light in their eyes. As a people leader, isn’t it just as critical that you are an Energy Leader, rather than an Energy Drainer? Think about your most recent meeting: what you were thinking about, what you were doing, and how the other people in the meeting were responding. For each of the following six questions, decide whether you were an Energy Drainer or Energy Leader; then place one point in the appropriate column. Add up the total points in each column. Did you score more Energy Drainer points, or more Energy Leader points? How can you improve your energy leadership? There are three misperceptions that prevent many people from even trying to be an Energy Leaders. 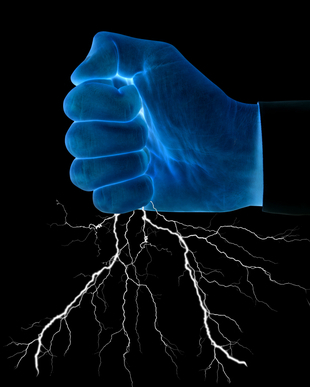 Myth: Only extraverts can be Energy Leaders. As Akim Nowak explains in Infectious: How to Connect Deeply and Unleash the Energetic Leader Within, there are many ways to add energy that have nothing to do with being extraverted or the center of attention. Nowak’s book provides five “power plugs” to help anyone do just that. Myth: Being an Energy Leader involves pouring all your energy into others, with the result that you become personally depleted. For most of us, leading can involve interactions that leave you exhausted. But that should be the exception. Nowak’s book can help you learn to change the nature of most interactions to mutually energize you and others. To make up for the times that do de-energize you, identify practices in your life that will keep you energized, and make time for them. Myth: Energy Leaders give but never take. Energy Leaders draw energy from others, but they don’t drain energy from others. That’s an important distinction. In astronomy, a black hole is a gravitational monster that prevents any matter or energy (including light) from escaping. Don’t be a black hole! Focus on other people, rather than yourself. Focus on making a difference in people’s lives. Talk less; view your role more as listener and facilitator. Look into other people’s eyes, especially when you are speaking. Be curious and ask genuine “learning” questions. Question: What are other ways to be an Energy Leader? 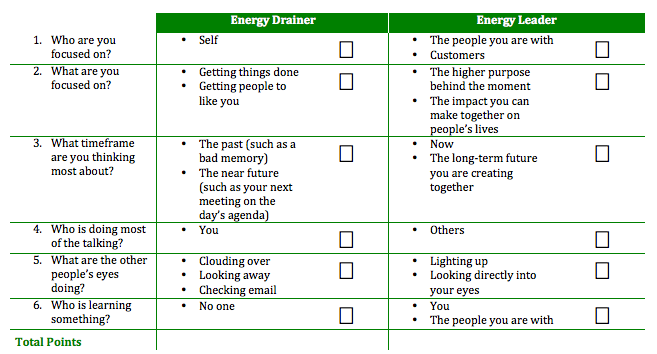 And what would you add to the self-assessment above: are there other marks of an Energy Drainer or Energy Leader? Share your thoughts in the comments section. Jesse Lahey, SPHR, is the host of the Engaging Leader podcast, host of the Game Changer podcast series, and managing principal of Aspendale Communications. Connect with him on Twitter, Facebook, or LinkedIn. If you know anyone who would benefit from this information, please share it!